HA!I have been looking at that pattern since Kay first issued it! My initial problem was getting over my dislike of Silk Garden; the colors are divine and I do love the feel of it, but those little silk bits drive me nuts and then I drive my family nuts. I'll sit there and obsessively pick them out and then they float around the room and land on everything. I remember stopping in the store a couple of years ago and mentioned something about it to you and you shook your head and laughed and said that you can tell a lot about someone by the way they approach Silk Garden...whether they can leave it alone or not! Yorkshire Tweed Aran is a fantastic choice. Doggone you! I had just set the pattern aside in frustration and now I'm rethinking! You sure do beautiful work! I have to think that there's some purpose in the joint occurrence of Kay's mitered cross pattern and the new "Modern Log Cabin Quilting" -- have you seen the cover?! 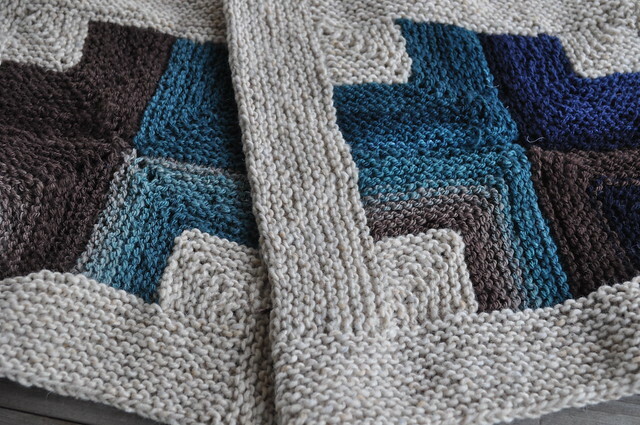 I don't quilt, but I love garter stitch blankets made to look like quilts (Veronik Avery's Bear Claw Blanket being a favorite project of mine). I saw the two images within a couple of days of each other, and ... I need to do something with the comparison. It's too good. Beautiful! Wonderful design, great way to use your handspun, and great excuse to spin some more. @Margaret, Kay was inspired by that quilting book cover.